Pancreatic pseudocysts are complications of pancreatitis, pancreatic trauma, or pancreatic surgery. Pancreatic pseudocysts occur around the pancreas and are due to a break in continuity of the pancreatic duct, which leads to a leak of pancreatic “juice.” This “juice” (pancreatic secretion) helps digest food. The inside lining of the intestine (mucosa) is adapted to tolerate pancreatic secretions; however, other structures of our body are not. Once the fluid leaks and touches other organs inside your body, its toxic digestive effects are immediately noticed because of the severe pain produced. The body responds to pancreatic pseudocysts by creating a thick wall around the leak, thus protecting the rest of the body from damage. Once the wall is formed, pancreatic fluid continues to flow into this new cavity, which increases in size. This process is slow and may take weeks to months. The symptoms are generally pain and a feeling of fullness due to increased pressure on the stomach from the growing cyst. Although this condition is benign, it makes patients feel weak and drained of energy, and so requires prompt attention. 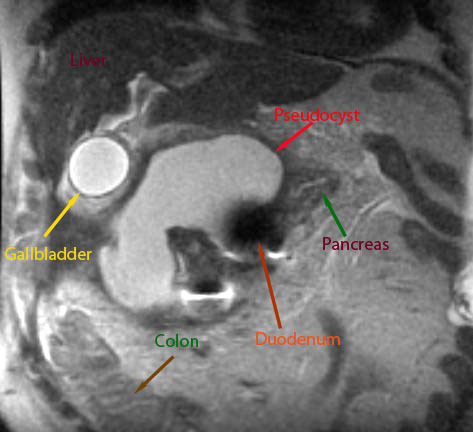 Pancreatic Pseudocyst Surgery is a best in class treatment for this problem and patients typically make a full recovery. One pancreatic pseudocyst treatment option is an endoscopic procedure that allows the NYC pancreatic surgeon complications specialist to place stents across the disrupted pancreatic duct to seal the leak. The cyst might then be drained into the stomach using endoscopic ultrasound technology. When such endoscopic measures are not possible, pancreatic pseudocysts surgery is indicated. The typical surgical procedure is called “cyst-gastrostomy”. This involves the surgeon opening the stomach, draining the cyst, and creating a permanent connection to allow pancreatic fluid to drain internally into the intestinal tract. This surgical procedure is commonly performed using the da Vinci robotic system or laparoscopy. If the surgery is performed using one of these minimally invasive techniques, the hospital stay ranges from 24 to 72 hours. In very complex multiple cysts, a traditional open surgical approach must be used. In this case, additional connections to the small intestine (cyst-jejunostomy) might be created. Dr. Alden offers remote consultations to patients and medical professionals anywhere in the world via phone or SKYPE. Please follow this link to learn more: remote consultations.